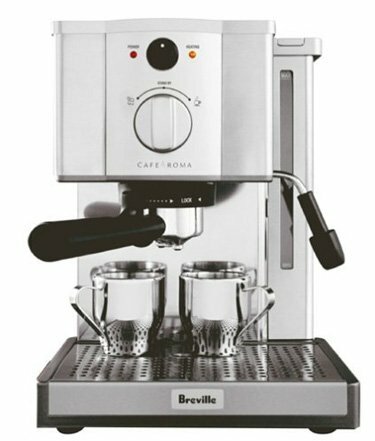 The Breville Cafe Roma espresso machine has a beautiful polished and retro inspired design and great features that will enable you to make delicious coffee drinks. Stainless steel housing. Durable and easy to clean and maintain. Easy to fill water tank with an external window for easy water level monitoring. Dual filter allows you to make single, or double shot espresso. Also enables you to use E.S.E pods. Steam want for froth enhancer for easy milk frothing. Cup warming tray, removable drip tray. Included with your machine: a set of stainless steel espresso cups and a stainless steel frothing pitcher. Click here to read the customer reviews of the Breville Cafe Roma and to buy it. Making your favorite coffee drink is as easy as pressing a button with this Nespresso machine. It uses Nespresso’s patented coffee capsule system to bring you a mess-free, easy to make, always prefect cup of coffee. 19 bar pressure pump, 25 seconds preheat time, powers off automatically after 9 minutes of inactivity. Easy capsule insertion, automatic ejection. Capsule drawer holds up to 10 used capsules before having to discard them. 34 ounce removable water tank. Integrated Aeroccino milk frother makes hot or cold milk froth with a press of a button. Adjustable cup tray accommodates different cup sizes. Ability to program coffee sizes/volume. Click here to read the customer reviews of the Nespresso CitiZ and to buy it. This espresso machine by Mr. Coffee gives you the convenience of touch-button features with the ability to use your choice of ground coffee. Simple to read and use control panel with buttons to choose single or double shot espresso, capuccino or latte. Milk frother automatically creates the perfect froth for your requested drink. Milk tank is removable for easy refilling and perfect for storing leftover milk in the fridge. Portafilter includes single or double shot filters. Includes measuring scoop with tamper. Click here to read more about the Mr Coffee Cafe Barista, read customer reviews and buy it. See more espresso machines under $300 here. Which of These Espresso Makers Should You Choose? To answer this, the first question to ask is: do you want to use your own ground coffee or capsules? If you prefer using your own coffee beans, then you’ll want to choose between the the Breville Cafe Roma or Mr. Coffee Cafe Barista since the Nespresso CitiZ uses capsules. The second question is: do you want an automatic machine or a manual machine? The Breville Cafe Roma works manually, where you have to control your shot and froth the milk manually, too. While the Mr Coffee Cafe Barista and Nespresso CitiZ are automatic. With the Mr. Coffee Cafe Barista, you’ll have to fill the portafilter, tamp it and attach it to the machine. After that, it’s a push-button operation with automatic flow stop and automatic frothing. With a Nespresso, it’s as simple as inserting a capsule and pushing a button. Same goes for the frother. Fill it up with milk and push a button. The Nespresso CitiZ (or any Nespresso machine) is the easiest to clean and maintain. You don’t have to clean it up after every use, since at least 8 or more capsules will be collected before having to discard them. As for the milk frothing, thanks to its non-stick interior, a simple rinse clean up will do.